Cut the cabbage into quarters and remove core. Slice thinly with a mandolin or sharp knife and then chop as desired. 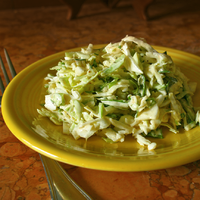 Layer each quarter of the chopped cabbage in a very large mixing bowl and sprinkle each layer with salt as you go - approx. 1/4 teaspoon salt for each of the 4 layers. Toss the salted chopped cabbage to mix and let stand while you are preparing the dressing - at least 15 minutes. Combine all the remaining ingredients in stainless steel or glass mixing bowl and mix well. Serving suggestion: I mix a generous portion of this slaw into Canned Pink Salmon instead of the usual celery. I add a bit of Olive Oil, dollop of mayo and a splash of gluten-free Tamari. Great served alone on a plate topped with a sprinkle of toasted Sesame Seeds.